Pylon signs are a very popular selection for businesses in a wide range of industries. Once you consider all of the benefits of pylon signs, it’s easy to understand why they’re a go-to choice for so many companies. Illuminated pylon signs will catch the eye of people passing by your business during both the day and night. These attractive signs make it easier for current and prospective customers to find your business as these signs are easy to see from a distance. Pylon signs can work for a single business, or they’re versatile enough to be a signing solution to help you location in a larger plaza stand out from the other businesses nearby. Greenfield Signs & Lighting offers custom pylon signs for customers in Indianapolis and the surrounding areas of Indiana. 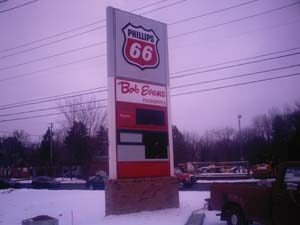 Our custom pylon signs are a cost-effective business signage solution, and require little to no maintenance. We can handle the entire process, from the initial design to the actual installation of your custom business sign. Business signage provides your company with advertising 24 hours a day and 365 days a year, making it a wise investment, regardless of the industry you’re in. If you would like to learn more about the benefits of custom pylon signs or if you would like to schedule a free initial consultation with us, call us today at 317-469-3095 to get started.